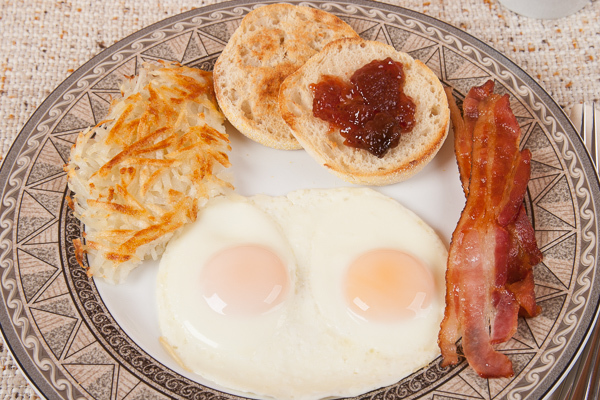 Hash brown potatoes are a popular part of a full American breakfast. The reason is simple, they are filling, quick, and inexpensive to make. For the basic recipe, all you need are russet potatoes, oil, salt, and pepper. 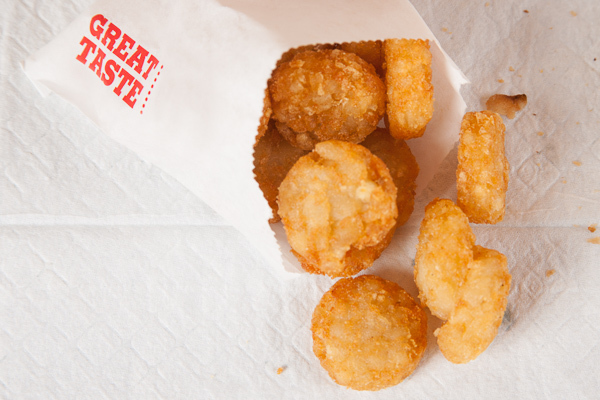 One problem with restaurant and “instant” hash brown potatoes is the amount of sodium and in the case of fast food restaurant hash brown potato bites the number of calories. The “small order” pictured below, about 3 oz. (85 g), has 250 calories, 4 grams of saturated fat, and over 400 mg of sodium. They may taste great (actually they were greasy and didn’t), but these potato bites provide 40 percent of the calories in the complete breakfast pictured above. While hash brown potatoes are a common breakfast item, you can serve with any meal. One half of this recipe, about 3 ounces (85 g), has about 160 calories and 80 mg of sodium. A fraction of the calories and sodium of restaurant and frozen fried potatoes. They are also easier to make. Low carb diet promoters vilify starchy vegetables like potatoes and especially white potatoes, and recommend eliminating them from your diet. What they fail to tell people is that potatoes are packed with nutrients and are one of the best sources of potassium. While a high sodium diet can increase blood pressure, a high potassium diet can lower blood pressure. Eight ounces (225 g) of shredded russet potato has about 950 mg of potassium. Adding 1/4 teaspoon of table salt to this recipe adds 600 mg of sodium; kosher salt 300 mg of sodium. Not bad for a vilified vegetable. Peel potato, rinse, and shred into a medium bowl or strainer. Cover with cold water, stir, and drain. Repeat. Soaking removes some the starch. Heat oil in an 8" or 9" (20 to 23 cm) skillet over medium heat 1 to 2 minutes. Add potato, press to flatten, season with salt and pepper, and cook 5 minutes or until browned. Cover skillet with a large plate, flip the potatoes onto the plate, and carefully slide back into the skillet. Season with salt and pepper and cook second side 5 minutes or until browned and potatoes are tender. Serve immediately.